Goodwin (Achilles/calf) will not play in Sunday's game against the Rams, Nick Wagoner of ESPN.com reports. Analysis: Two of the three DNPs on Thursday have already been ruled out for Sunday's season finale against the Rams -- Matt Breida (ankle) and Dante Pettis (knee) -- and Goodwin may join them with another absence Friday. If that comes to pass, the 49ers' receiving corps will be left in the hands of Kendrick Bourne, Trent Taylor, Richie James and Steven Dunbar. 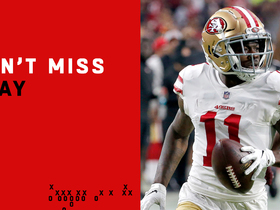 Analysis: Prior to both of the 49ers' past two games, Goodwin tended to a calf injury but suited up anyway, combining for four receptions (on nine targets) for 36 yards. During the most recent outing, he suffered what was termed an Achilles issue, but coach Kyle Shanahan later labeled the setback as a bruised calf, per Nick Wagoner of ESPN.com. Whatever the nature of the concern, Shanahan said Goodwin's practice reps will be kept in check this week. Analysis: This development is great news for Goodwin, who was originally speculated to have suffered an Achilles injury during Sunday's loss to Chicago. However, it still isn't certain if the receiver will be available to play in the season finale this Sunday against the Rams. Look for Wednesday's injury report to be the next step towards clarifying matters. Goodwin caught three of his eight targets for 29 yards in the 14-9 loss to the Bears on Sunday. Analysis: Goodwin evidently suffered an Achilles injury in the later stages of the game, but according to Matt Maiocco of NBC Sports Bay Area, it doesn't appear to be serious. Given Dante Pettis is expected to miss Week 17 after suffering a MCL injury Sunday, it's unclear whether the 49ers will plan to risk another member of their wide receiving core in next week's meaningless contest. Fantasy owners will want to monitor Goodwin's practice status in the coming days to gather more information. Goodwin (calf) caught his lone target for seven yards in Sunday's 26-23 win over Seattle. Goodwin (calf) is listed as active Sunday versus the Seahawks. Analysis: In his return last weekend from a two-game absence due to a personal issue, Goodwin ranked third among 49ers wide receivers (24 of 72 snaps on offense) behind Dante Pettis (61) and Kendrick Bourne (43). A similar amount of work can be expected against a Seattle defense that has conceded 8.5 YPT and 13 touchdowns to wideouts in 13 contest this season. Goodwin (calf), who is listed as questionable for Sunday's game against the Seahawks, is expected to play, a source told Adam Schefter of ESPN. Goodwin (calf) is listed as questionable for Sunday's game against the Seahawks, Matt Maiocco of NBC Sports Bay Area reports. Goodwin was listed as a limited participant at Thursday's practice due to a calf injury, Cam Inman of The San Jose Mercury News reports. Goodwin (personal) reeled in both of his targets for 20 yards in Sunday's 20-14 win over Denver. Goodwin (personal) wasn't listed on the 49ers' injury report Wednesday, Cam Inman of The San Jose Mercury News reports. Analysis: In his return to the team facility, Goodwin logged every practice rep in his first session since Nov. 23. With his personal issue behind him, he'll turn his focus to a Week 14 matchup with the Broncos, who will be without top cornerback Chris Harris (fibula) on Sunday. Goodwin (personal) is expected to practice Wednesday, Cam Inman of The San Jose Mercury News reports. Analysis: After missing the last two games due to a personal concern, Goodwin is slated to make his presence felt on the practice field for the first time since Nov. 23. There's no reason to believe he won't be a full participant, but Wednesday's injury report will confirm as much. With Pierre Garcon hobbled by a knee injury, Goodwin should have plenty of targets to work with Sunday versus the Broncos. Goodwin (personal) is expected to return to the 49ers on Monday, Cam Inman of The San Jose Mercury News reports. Analysis: In the midst of missing back-to-back games due to a personal issue, Goodwin met with team officials last Thursday and attended a different meeting at the team facility Monday. Until the 49ers have an opportunity to practice Wednesday, it'll be difficult to outright clear Goodwin of a designation, so the 49ers' first Week 14 injury report will be one to watch out for. Goodwin (personal) has been ruled out for Sunday's game in Seattle, Nick Wagoner of ESPN.com reports. Analysis: Goodwin met with team officials Thursday but didn't practice at all this week. With both he and Pierre Garcon (knee) ruled out, the 49ers will rely on Dante Pettis, Kendrick Bourne and Richie James as their primary options at receiver. Goodwin (personal) didn't practice Friday and isn't expected to play Sunday in Seattle, Matt Barrows of The Athletic reports. Analysis: Goodwin met with 49ers officials Thursday but still hasn't rejoined his teammates at practice. He'll presumably be held out for at least one more week while tending to the undisclosed personal matter. Goodwin was absent from practice Thursday, but the wide receiver met with the 49ers, likely regarding his personal matter, Cam Inman of The San Jose Mercury News reports. Analysis: The matter first emerged on Monday, Nov. 19, but Goodwin was back with the team in time to log every practice rep in advance of Week 12. However, the team downgraded him to doubtful Saturday before deeming him inactive this past Sunday at Tampa Bay, again due to the personal issue. Although he remains away from practice, the fact he had a meeting with team officials could mean a return is imminent. Friday's injury report may shed some light on his potential to play Week 13 in Seattle. Goodwin (personal) remains away from the 49ers while dealing with a family matter, Matt Barrows of The Athletic reports. 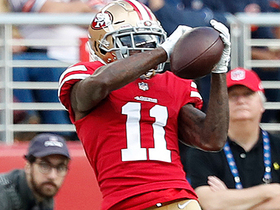 Analysis: With Goodwin and Pierre Garcon (knee) both absent in Sunday's 27-9 loss to the Buccaneers, the 49ers relied on Dante Pettis, Kendrick Bourne and Richie James at wide receiver. It's unclear if Goodwin or Garcon is expected to return for Week 13 at Seattle. Goodwin (personal) is inactive for Sunday's Week 12 tilt against the Buccaneers. Analysis: Goodwin had been downgraded to doubtful Saturday, so the inactive designation is far from surprising. With fellow wideout Pierre Garcon (knee) also out, the San Francisco receiving corps will be headlined by the trio of Kendrick Bourne, Dante Pettis and Trent Taylor, with Richie James serving as the No. 4 option. Tight end George Kittle should also see a major boost in targets as a result of the multiple absences. Goodwin was downgraded to doubtful for Sunday's game at Tampa Bay due to a personal matter, Matt Maiocco of NBC Sports Bay Area reports. Analysis: Goodwin was excused from practice early in the week due to a personal issue but had returned to practice and avoided a game designation by Friday. It remains to be seen if the 28-year-old is dealing with the same matter, but he's nonetheless been excused from the team after initially traveling to Tampa Bay. With Pierre Garcon (knee) already ruled out, the 49ers will likely be without their top two wide receivers Sunday, leaving Kendrick Bourne and Dante Pettis as the top remaining options. Goodwin (personal) isn't listed on Wednesday's injury report, Jenna Laine of ESPN.com reports. 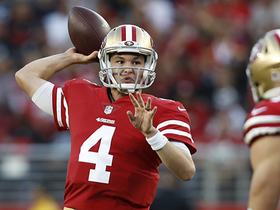 Analysis: Goodwin is back with the 49ers after missing Monday's practice for personal reasons. His target volume has been disappointing, but there is cause for optimism this week as he prepares to face a Bucs defense that has yielded a league-worst passer rating of 124.9. Goodwin was excused from Monday's practice for personal reasons, Eric Branch of the San Francisco Chronicle reports. Analysis: There was some concern Goodwin may have dealt with concussion symptoms during San Francisco's bye week, but it turns out his absence from the practice field isn't health-related. Assuming he rejoins the team later this week, Goodwin will get a fantastic matchup in Tampa Bay on Sunday, facing a defense that's given up 8.9 yards per pass attempt and 2.5 passing touchdowns per game. Goodwin isn't practicing Monday, Cam Inman of The San Jose Mercury News reports. 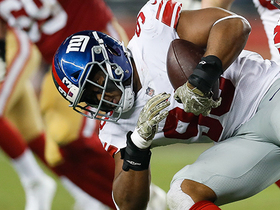 Analysis: Goodwin was twice evaluated for concussion symptoms during last Monday's 27-23 loss to the Giants, receiving clearance to rejoin the game on both occasions. Coming out of a Week 11 bye, it's unclear if his absence from practice is related to the hard hits he took in the Niners' last game. 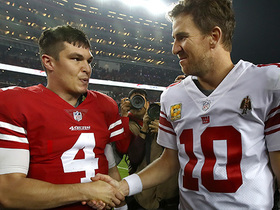 With Pierre Garcon (knee) already banged up, quarterback Nick Mullens won't have much help if Goodwin isn't able to play Sunday in Tampa Bay. Goodwin emerged from Monday's 27-23 loss to the Giants with no concussion symptoms, Jennifer Lee Chan of NBC Sports Bay Area reports. Analysis: Goodwin was removed and checked for symptoms after a three-play stretch in which he took two hits to the head, but he avoided any symptoms associated with a concussion. With a bye on tap Week 11, he'll be ready to roll once the 49ers begin prep for a visit to Tampa Bay on Nov. 25. For the season, Goodwin has no more than four catches or five targets in a given appearance. He's offset those average marks with stellar efficiency: 19.9 YPC, 10.6 YPT and four touchdowns on 32 targets. Goodwin caught four of five targets for 69 yards in Monday night's 27-23 loss to the Giants. Goodwin brought in one of four targets for 11 yards in the 49ers' 34-3 win over the Raiders on Thursday. 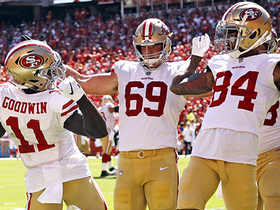 Analysis: Goodwin didn't quite flash the same level of chemistry with rookie quarterback Nick Mullens that fellow pass catchers George Kittle and Pierre Garcon did. It was the speedster's second consecutive game with one reception and a 25.0 percent catch rate, although Goodwin's sole grab in Week 8 against the Cardinals went for a 55-yard touchdown. The 27-year-old remains the 49ers' best deep threat by far and will look to bounce back against the Giants in a Week 10 battle. Goodwin was targeted four times and turned his lone reception into a 55-yard touchdown during Sunday's 18-15 loss to the Cardinals. Analysis: Goodwin made the most of his only offensive touch, taking a short pass across the middle and racing past multiple defenders on the way to the end zone. He was quiet last week against the Rams, but this outing gives him three touchdowns in his last three games. Goodwin is still rather dependent on big plays for fantasy utility, but this was a reminder that he's still able to deliver when given the opportunity. The speedster will face off against the Raiders on Thursday. Goodwin caught two of five targets for 24 yards during Sunday's 39-10 loss to the Rams. Analysis: Just a week removed from exploding for 126 yards and a pair of scores versus the Packers, Goodwin hardly made an impact in this one. He did finish second on the team in targets, but his grabs went for seven and 17 yards as he received plenty of attention from the defense. Goodwin's fantasy value should be rather volatile with C.J. Beathard under center and he'll look to bounce back next Sunday against the Cardinals. Analysis: Just a week removed from exploding for 126 yards and a pair of scores versus the Packers, Goodwin hardly made an impact in this one. He did finish second on the team in targets, but his grabs went for seven and 17 yards as he received plenty of attention from the defense. Goodwin's fantasy value should be rather volatile with C.J. Beathard under center, and he'll look to bounce back next Sunday against the Cardinals. Goodwin caught four of five targets for 126 yards and two touchdowns in Monday night's 33-30 loss to the Packers. Analysis: Goodwin did damage from distance, scoring from 67 and 30 yards on his two touchdowns Monday. The shifty wideout comfortably led San Fransisco in receiving yards, which came after he mustered just 54 yards through his first three games. With firepower lacking in the 49ers passing attack, Goodwin will aim to keep the big plays coming, although a matchup versus the Rams on Sunday should temper expectations. Coach Kyle Shanahan said Goodwin (hamstring/thigh) would practice in full Thursday, Cam Inman of The San Jose Mercury News reports. Goodwin (hamstring/thigh) will be re-evaluated prior to Thursday's practice before the team has an idea regarding his availability for Monday's game against the Packers, Cam Inman of The San Jose Mercury News reports. Analysis: Goodwin has already missed two games this season and could be trending toward another absence if the dual injuries prevent him from taking part in practice this week. Coach Kyle Shanahan has already ruled out Dante Pettis (knee) for Week 6, so if Goodwin joins Pettis on the inactive list, Richie James and Victor Bolden could see extended time at split end in lieu of the injured duo. Goodwin (hamstring/quadriceps) is inactive for Sunday's Week 5 tilt against the Cardinals. Analysis: Goodwin was heavily expected to miss Sunday's contest, with the inactives list now officially confirming that notion. With fellow wideout Dante Pettis (knee) sidelined as well, look for Pierre Garcon, Trent Taylor, Kendrick Bourne and even tight end George Kittle to benefit from the thin receiving corps. Goodwin (hamstring/quadriceps) is not expected to play Sunday against the Cardinals, Adam Schefter of ESPN reports. Analysis: Official confirmation of Goodwin's Week 5 status will arrive approximately 90 minutes before Sunday's 4:25 p.m. EDT kickoff, but this nugget should be enough for those considering him in fantasy lineups this week to seek alternatives at wideout. Goodwin (hamstring/quadriceps) will be a game-time decision Sunday against the Cardinals, Nick Wagoner of ESPN.com reports. Analysis: Goodwin is listed as questionable on the final injury report after missing practice Wednesday and turning in limited sessions Thursday and Friday. He hasn't topped 42 snaps or four targets in any game this season, and his ceiling dropped by a considerable amount when Jimmy Garoppolo suffered a season-ending knee injury. With the 49ers scheduled for a 4:25 p.m. EDT kickoff, Goodwin only makes sense as a fantasy option for the truly desperate. Goodwin (hamstring, quadriceps) was limited in Thursday's practice, Nick Wagoner of ESPN.com reports. Analysis: The 49ers bumped Goodwin from DNP to a limited participant in the span of two days, setting up the wideout for even more work to wrap up Week 5 prep. While he'll aim for a full session Friday, he doesn't seem to be in danger of sitting out Sunday's game against the Cardinals. Unfortunately for the wideout, injuries to his upper leg appear to have sapped him of his field-stretching potential, as he has just one catch of 20-plus yards in three games this season. Goodwin didn't practice Wednesday due to hamstring and quad injuries, Matt Barrows of The Athletic reports. Goodwin (thigh/hamstring) isn't practicing Wednesday, Matt Maiocco of NBC Sports Bay Area reports. Coach Kyle Shanahan said Monday that Goodwin is tending to thigh and hamstring injuries, Matt Maiocco of NBC Sports Bay Area reports. Goodwin caught two of four targets for 24 yards in Sunday's 29-27 loss to the Chargers. Analysis: Goodwin has now seen just nine targets in his three games this season, but perhaps the fact he briefly left the game due to an undisclosed injury at least partially explains the lack of attention he received in this one. A popular sleeper pick in the preseason, the sixth-year pro has yet to deliver this year after totaling 962 yards on 56 catches a season ago. He'll try to get rolling at home Week 5 against Arizona. Goodwin (quadriceps) was a full practice participant Thursday, Nick Wagoner of ESPN.com reports. Analysis: With an uninhibited practice behind him, Goodwin is out of the woods as it pertains to an appearance Sunday against the Chargers. In his return from a one-game absence Week 3 at Kansas City, he parlayed 61.8 percent of the offensive snaps into three catches for 30 yards and one touchdown. Even with C.J. Beathard instead of Jimmy Garoppolo (knee) under center, Goodwin's game-breaking ability should shine through as he puts his "deep" thigh bruise further in the rear-view mirror. Goodwin (quadriceps) practiced in a limited capacity Wednesday, Cam Inman of The San Jose Mercury News reports. Goodwin (quadriceps) brought in three of four targets for 30 yards and a touchdown in the 49ers' 38-27 loss to the Chiefs on Sunday. He also lost two yards on his sole rush. Analysis: Seeing his first game action since the opener, Goodwin had a slow start but eventually found the end zone on a third-quarter, 11-yard scoring dart from Jimmy Garoppolo (knee). The speedster only logged another pair of catches for 19 yards on the afternoon, however, and the uncertainty regarding the quarterback's status moving forward could certainly affect Goodwin's future production. Goodwin will look to build on Sunday's performance with whoever is under center Week 4 against the Chargers. Goodwin (quadriceps) is listed as active Sunday at Kansas City. Analysis: Goodwin progressed from a non-participant during Week 2 prep to logging limited sessions this week, but his availability seemingly came down to his ability to get through a pregame workout without complications. Still, it remains to be seen what kind of workload he can handle after spending two weeks in recovery mode from a "deep" thigh bruise. When healthy, Goodwin is the field-stretching pass catcher for Jimmy Garoppolo, which could yield fruit against the Chiefs' league-worst pass defense. Goodwin (quadriceps) is listed as questionable for Sunday's contest in Kansas City, David Lombardi of The Athletic reports. Analysis: Despite upgrading to a limited participant at practice this week, Goodwin is slated to be a game-time call Sunday. "He's not there yet," coach Kyle Shanahan told Eric Branch of the San Francisco Chronicle on Friday. "Hopefully, he will be Sunday." Ultimately, Goodwin's "deep" thigh bruise still requires some improvement before the 49ers' training staff gives him clearance to play. Head coach Kyle Shanahan indicated Friday morning that Goodwin (quad) will be a game-time decision for Sunday's game against the Chiefs, Eric Branch of the San Francisco Chronicle reports. "He's not there yet," Shanahan said of Goodwin. "Hopefully, he will be Sunday." Analysis: Goodwin logged limited practices both Wednesday and Thursday, so he is making progress after sitting out practice all last week. Still, it appears regardless of how much work he gets in Friday, a final call on his Week 3 status will not come until game day. Goodwin (quadriceps) was a limited practice participant Thursday, Nick Wagoner of ESPN.com reports. 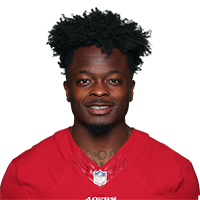 Analysis: After a week in which he didn't practice and was eventually ruled out due to a "deep" thigh bruise, Goodwin has logged back-to-back limited showings this week. According to Matt Maiocco of NBC Sports Bay Area, Goodwin participated in route-running drills and ran routes themselves, so he seems to be on the path to gaining clearance from the 49ers training staff. Look for his Week 3 status to gain some clarity upon the release of Friday's injury report. Goodwin (quadriceps) will return to practice Wednesday as a limited participant, Eric Branch of the San Francisco Chronicle reports. Goodwin (quad) has been ruled out for Sunday's game against Detroit, Cam Inman of The San Jose Mercury News reports. Analysis: Recovering from an injury coach Kyle Shanahan described as a deep thigh bruise, Goodwin was unable to practice with his teammates all week, but he at least was spotted doing some side work at the beginning of Friday's session. Per Nick Wagoner of ESPN.com, Shanahan confirmed that rookie second-round pick Dante Pettis will replace Goodwin in the Week 2 starting lineup against a shaky Detroit defense. Goodwin will turn his focus toward getting healthy for a Week 3 contest in Kansas City. 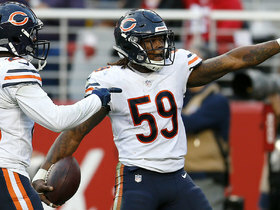 Goodwin (quad) isn't in uniform for the start of Friday's practice, Eric Branch of the San Francisco Chronicle reports. Analysis: Though he isn't practicing with his teammates, Goodwin is at least doing some work off to the side, perhaps giving him a shot to be listed as a limited participant on the final injury report. He was a non-participant both Wednesday and Thursday, leaving his status for Sunday's game against the Lions in serious question. Goodwin (quadriceps) didn't practice Thursday, Matt Maiocco of NBC Sports Bay Area reports. San Francisco head coach Kyle Shanahan said Wednesday that he considers Goodwin (thigh) questionable for Sunday's game against Detroit, Nick Wagoner of ESPN.com reports. Coach Kyle Shanahan considers Goodwin "day-to-day" due to a "deep thigh bruise," Joe Fann of the 49ers' official site reports. Analysis: Goodwin picked up the injury in the second quarter Sunday in Minnesota when he took a knee to his right quad, after which he primarily was used as a decoy. He subsequently received just one target from Jimmy Garoppolo, which is a far cry from the 6.6 per game of his 2017 breakout. Considering he's day-to-day and won't be required to suit up again until 4:05 PM ET on Sunday, Goodwin has plenty of time to focus on rehab and even take part in practice this week. Goodwin is dealing with a right quadriceps contusion and should be considered questionable heading into Week 2, Cam Inman of The Mercury News reports. Goodwin (quadriceps) re-entered Sunday's game against the Vikings in the third quarter, Nick Wagoner of ESPN.com reports. Analysis: Goodwin suffered a painful-looking quad injury when he was upended early in the contest, resulting in him missing a little over a quarter of action. After working out on the exercise bike on the sideline, the 49ers cleared the wideout to return to action, suggesting the injury was never much of a concern. He'll now look to salvage what had been a catchless season debut prior to his departure. Goodwin is questionable to return to Sunday's game at Minnesota due to a quadriceps injury. Analysis: After he was examined in the medical tent, Goodwin was seen walking around gingerly on the sideline and soon diagnosed with the injury. While the 49ers determine whether Goodwin will reenter the game, rookie second-rounder Dante Pettis has been filling in at wideout. Goodwin caught three of four targets for 40 yards during Saturday's 23-17 loss to the Colts. Goodwin returned to Saturday's preseason contest at Indianapolis, Cam Inman of The San Jose Mercury News reports. Analysis: Goodwin left the field for a spell and was listed as questionable to come back following a first-half hand injury. No matter, it was only serious enough for the wideout to be gone as long as was necessary to mend the hand. Goodwin promptly made a catch for a third-down conversion, so he's seemingly good to go moving forward. Goodwin is questionable to return to Saturday's preseason game at Indianapolis due to a hand injury, Matt Maiocco of NBC Sports Bay Area reports. Analysis: Goodwin was escorted to the locker room in the first half with a hand issue of unknown severity. Through training camp and two exhibitions, he was shaping out to be Jimmy Garoppolo's top option in the passing attack, but Pierre Garcon made a play at that spot Saturday, boasting two catches (on three targets) for 62 yards at the time of Goodwin's departure. Expect coach Kyle Shanahan to discuss Goodwin's health after this contest. Goodwin caught each of his three targets for 61 yards in Saturday's preseason game against the Texans. Analysis: The receptions all came from Jimmy Garoppolo on third downs, including a 40-yard gain down the left sideline on the third snap of the game. Reports out of training camp suggest Goodwin -- rather than Pierre Garcon -- has been Garoppolo's go-to target in practice this summer. The first two weeks of the preseason have supported that notion, with Goodwin holding a 6-2 advantage in targets and a 4-1 edge in receptions. Goodwin has been Jimmy Garoppolo's favorite target throughout training camp, ESPN.com's Nick Wagoner reports. Analysis: Goodwin reportedly is getting more looks than Pierre Garcon, who was sidelined by a neck injury during Garoppolo's stretch as the starting quarterback last season. The trend continued into the team's first preseason game, with Goodwin holding a 3-0 target advantage over Garcon on six Garoppolo pass attempts. Not that there was much doubt after what happened last year, but it's increasingly clear the 49ers view Goodwin as far more than a modest-volume deep threat. Goodwin (back) had three downfield catches during Thursday's practice, Matt Barrows of The Athletic reports. Analysis: Goodwin signed a three-year, $20.3 million extension in March and participated in most of the offseason program, but he was held out of June minicamp while dealing with a sore back. The issue apparently didn't linger throughout the summer, as the speedy wideout made a strong impression during the first practice of training camp. Goodwin and Pierre Garcon are locked in as starters, with Trent Taylor (back) favored to beat out Dante Pettis and Kendrick Bourne for the No. 3 job. Goodwin will sit out minicamp due to a sore back, Dave Lombardi of The Athletic San Francisco reports. Analysis: San Francisco head coach Kyle Shanahan said Wednesday that the injury wasn't anything serious. Goodwin should be a full participant at the start of training camp, and he appears locked in as the 49ers' top wideout after receiving a three-year, $19.25 million contract extension this offseason. The 49ers reached agreement on a three-year, $20.3 million extension with Goodwin on Thursday, Josina Anderson of ESPN reports. Head coach Kyle Shanahan told Nick Wagoner of ESPN.com after Sunday's 34-13 win versus the Rams that Goodwin will fly back to San Francisco with the team. Goodwin (concussion) was transported to a local hospital after departing Sunday's game against the Rams, Matt Barrows of The Sacramento Bee reports. Analysis: In perhaps the worst hit of the weekend, Goodwin was eventually diagnosed with a concussion after showing visible signs of a serious head injury. That point likely spurred the 49ers' decision to sidestep any further in-house examinations and take the wideout to the hospital. Goodwin has had issues with concussions in the past, so his status will be monitored with a watchful eye in the coming days and weeks. Goodwin was Matt Maiocco of NBC Sports Bay Area and won't return to Sunday's road contest against the Rams. Goodwin (undisclosed) required a cart to leave the field after a hard hit during the second quarter of Sunday's road game against the Rams, Matt Barrows of The Sacramento Bee reports. Analysis: In a bit of head-hunting by LA reserve safety Blake Countess, Goodwin was laid out and remained on the turf for a significant amount of time. Once he was helped to his feet, Goodwin was clearly unsteady as the 49ers' training staff assisted him to the cart, per Eric Branch of the San Francisco Chronicle. Goodwin will likely be diagnosed with a concussion, but the team has yet to comment on the nature of the injury. Goodwin (back) doesn't have an injury designation for Sunday's game against the Rams, Matt Maiocco of NBC Sports Bay Area reports. Analysis: Goodwin played through the same injury in last week's 44-33 win over the Jaguars, catching three of six targets for 37 yards against one of the top secondaries in the NFL. He had at least six catches, 99 yards and eight targets in each of Jimmy Garoppolo's first three starts, and there's a decent chance Goodwin could return to that territory against a Rams team that will be resting some key players. Goodwin (back) was limited at Wednesday's practice, Cam Inman of The San Jose Mercury News reports. Goodwin caught three passes for 37 yards on six targets against Jacksonville on Sunday. Analysis: The ruthless Jaguars cornerback rotation unsurprisingly contained Goodwin, who had been one of the league's hottest receivers heading into this matchup. That emerging standout quarterback Jimmy Garoppolo led the 49ers to 44 points indicates that Goodwin's Olympic-grade athleticism helped open up the offense even if he didn't make the catches themselves. He's poised for a strong 2018 season, regardless of what happens against the Rams in Week 17. Goodwin (back) isn't listed on the final injury report for Sunday's game against the Jaguars, Nick Wagoner of ESPN.com reports. Analysis: Goodwin missed Wednesday's practice due to a personal matter and was limited with a back injury Thursday, but he never seemed to be in any real danger of missing Sunday's nightmare matchup with Jacksonville's dominant pass defense. He still figures to see plenty of volume, coming off three straight games with at least six catches, eight targets and 99 yards. Goodwin (back) returned to practice Thursday, putting in a limited showing, Nick Wagoner of ESPN.com reports. Goodwin (back) didn't practice Wednesday for personal reasons, Matt Maiocco of NBC Sports Bay Area reports. Goodwin caught 10 of 13 targets for 114 yards and carried one time for an additional 10 yards during Sunday's 25-23 win over the Titans. Godowin caught six of 12 passes for 106 yards in Sunday's 26-16 win over Houston. Analysis: Goodwin has been the biggest beneficiary of Jimmy Garoppolo's insertion under center, as the speedy wide receiver has compiled 14 catches for 205 yards in Garoppolo's two starts after snagging a combined 27 balls in his first 11 games this season. If he's still available on your waiver wire, teams in need of receiving help should give Goodwin serious consideration for the stretch run. Goodwin caught all eight passes directed his way for 99 yards in Sunday's 15-14 defeat of the Bears. Analysis: Those hoping a Jimmy Garoppolo-led offense would be a boon for Goodwin were rewarded on Sunday, as Goodwin had his best day of the season in terms of receptions to go with his second-best yardage and target totals. It was the former Longhorn's fourth straight game with at least 68 yards. He has some plus matchups coming up in Week 14 against Houston followed by Tennessee in Week 15. Goodwin snagged four of six passes for 78 yards during Sunday's 24-13 loss to Seattle. Analysis: Goodwin left the game temporarily with a foot injury, but returned to action to add two more catches to his total. The speedster caught more passes on Sunday than his previous three games combined and more good news might be on the way. Long-coveted quarterback Jimmy Garoppolo entered the game late after a tough hit on C.J. Beathard and promptly threw a touchdown. Should the 49ers go with Garoppolo, one would expect a positive uptick in production from the team's receivers. Goodwin (foot) returned to Sunday's game against the Seahawks, Matt Barrows of the Sacramento Bee reports. Analysis: Goodwin appeared to injure his foot in the third quarter but was cleared to return after getting checked out in the locker room. The big-play threat was quarterback C.J. Beathard's most-targeted receiver before going down, and that trend figures to continue now that Goodwin's back in the game. Goodwin injured his foot during Sunday's game against the Seahawks and is questionable to return. Analysis: Goodwin went down in the third quarter and was subsequently taken to the locker room for further evaluation. If he isn't able to return to the game, Goodwin will finish with two receptions (on four targets) for 57 yards. Goodwin turned his only catch into an 83-yard touchdown in Sunday's 31-21 win over the Giants. He also rushed once for 18 yards. 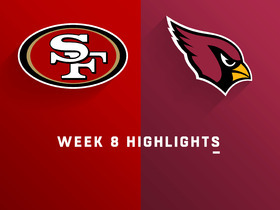 Goodwin secured two of eight targets for 64 yards during Sunday's 20-10 loss to the Cardinals. Goodwin could draw more targets with top wideout Pierre Garcon (neck) headed for injured reserve, Eric Branch of the San Francisco Chronicle reports. 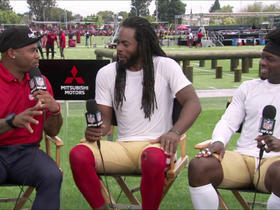 San Francisco 49ers wide receiver Marquise Goodwin breaks down how he beat cornerback Richard Sherman during training camp drill. San Francisco 49ers quarterback Nick Mullens' pass slips through wide receiver Marquise Goodwin's hands for an interception. San Francisco 49ers wide receiver Marquise Goodwin makes a phenomenal adjustment on this 17-yard sideline snag. 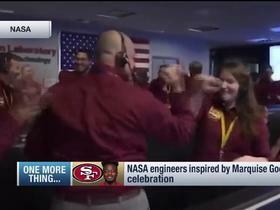 Watch where NASA engineers got inspiration from when they celebrated the landing of their InSight lander on Mars Monday. The San Francisco 49ers try for a game-winning drive, but come up short. New York Giants linebacker B.J. Goodson snags his second deflected interception of the game. San Francisco 49ers quarterback Nick Mullens tosses first-down pass on first NFL throw against the Oakland Raiders in Week 9 of the 2018 NFL season.